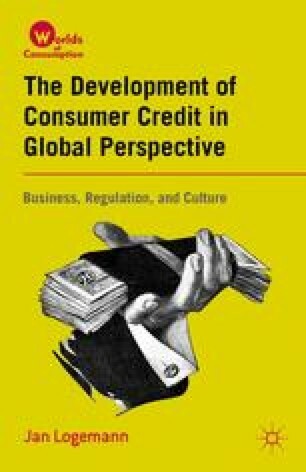 Despite nearly two decades of sustained economic growth both in the United States and across Western Europe, practices of consumer credit still differed notably in the late 1960s. As one contemporary observer pointed out, “About one-half of all Americans both approve of and use installment credit. At the other extreme, only one-fourth of the Germans approve of it, and only one out of ten actually has any installment debt.”1 West Germans, studies found, were much more likely to use their expanding savings to purchase new consumer durables. American households also maintained a considerable savings rate, but for different purposes. Asked in 1966 about the intended purpose of their savings, 45 percent of American family units stated that they were saving for a “rainy day” (such as illness, unemployment, or other emergency), 31 percent for retirement or old age, and 22 percent for education.2 In the absence of a more elaborate, cradle-to-grave social welfare system, Americans saw a greater need to set aside funds for these life events and risks. In contrast to West Germans, American consumers did not view saving for consumer goods as an attractive alternative to obtaining them through consumer debt.